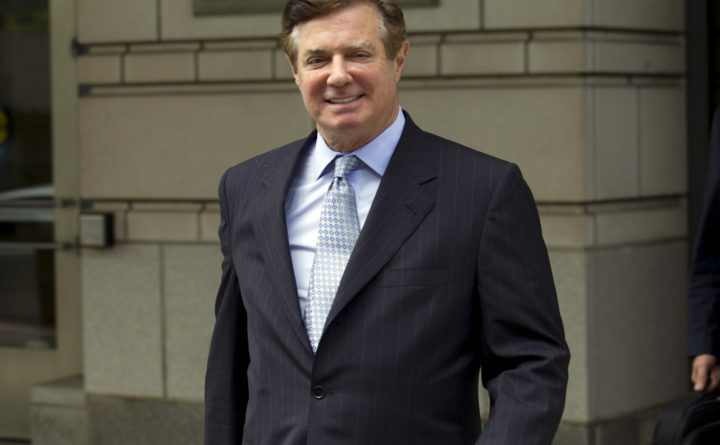 Paul Manafort, President Donald Trump's former campaign chairman, leaves the Federal District Court after a hearing in Washington, May 23, 2018. New revelations about Paul Manafort’s interactions with a Russian associate while he was leading President Donald Trump’s campaign provide a window into how extensively the special counsel has mapped interactions between Trump associates and Russians in his 20-month investigation. But new details inadvertently revealed in a court filing last week — including the fact that Manafort shared polling data about the 2016 race with an associate who allegedly has ties to Russian intelligence — indicate that special counsel Robert Mueller has also been scrutinizing interactions between Russians and Manafort while he helmed Trump’s presidential bid. Advisers to Trump are bracing for a final report by the special counsel, a confidential document summarizing his findings that they believe could be turned over to senior Justice Department officials next month. Mueller’s appointment was precipitated by Trump’s firing of FBI Director James Comey in May 2017 — a move that also led the FBI to open an investigation into the president to determine whether he obstructed justice and whether he sought to aid Russia, according to people familiar with the matter who spoke on the condition of anonymity. That investigation, which has both a criminal and counterintelligence component, was continued by Mueller. The new information about Manafort indicates that Mueller has been exploring what he may have communicated to Russians while working for Trump. And it serves as a stark reminder that as Trump was offering Russia-friendly rhetoric on the campaign trail, his White House bid was led for a time by a man with long-standing ties to powerful Russian figures. Manafort, an international lobbyist and political strategist, was embroiled in a multimillion-dollar financial dispute with Russian businessman Oleg Deripaska, who is close to President Vladimir Putin, according to court filings. He was also owed money by a political party in Ukraine that had failed to pay him for work he did after his client, the ousted leader Viktor Yanukovych, fled to Moscow amid public protests in 2014, filings show. New details about what Manafort and Kilimnik discussed during the campaign emerged last week, when Manafort’s team sought to rebut the allegation by the special counsel that Manafort lied to investigators after he pleaded guilty last fall and agreed to cooperate. They argued that Manafort, who has been jailed since June and who they said suffers from gout and depression, simply failed to remember certain key details until prosecutors refreshed his memory with documents and other evidence. In previous court filings, they have contended that Mueller has never turned over evidence to show that Manafort was in contact with Russian government or intelligence officials, suggesting that prosecutors have not detailed their evidence against Kilimnik. In their filing, Manafort’s attorneys said he did not recall either topic, because he was busy with his campaign duties. A judge has ordered Mueller’s team to file on Monday a new document explaining the “factual and evidentiary basis” to believe that Manafort lied in his interviews. The document will likely lay out in more detail what evidence Mueller has gathered about Manafort’s communications with Kilimnik. However, that information may be redacted from public view. The limited information revealed about their interactions suggests that the Russians may have seen Manafort as a politically connected figure who could help promote their interests, according to experts on the region. The U.S. had imposed punishing sanctions on Russia after it invaded Crimea in 2014. Anders Aslund, an economist and senior fellow at the Atlantic Council who has studied Russia and Ukraine, said a top Russian priority was a solution for Ukraine that recognized Russian control of Crimea and lifted sanctions. Any assurance Manafort might have offered that a Trump administration would accept such terms would have created a powerful incentive for Russia to root for a Trump victory – and to work to secure that outcome. By the time he joined Trump’s campaign in March 2016 to lead the candidate’s convention strategy, his consulting firm had collected more than $60 million from clients in Ukraine, but he was still deeply in debt to Deripaska and others, according to court documents and testimony. Kilimnik told The Post in 2017 that he came to the United States to meet with Manafort on May 7, 2016, and communicated with him frequently as Manafort’s role in Trump’s campaign expanded. “We talked about bills unpaid by our clients, about (the) overall situation in Ukraine where we spent 10 years working together, and about the current news, mostly related to the perception of the US presidential campaign in Ukraine,” Kilimnik said then in a statement. Trump had praised Putin several times on the campaign trail. In July, he began more stridently questioning the United States’ commitment to NATO. When WikiLeaks published thousands of stolen Democratic Party emails on July 22, Trump appeared to be unconcerned by the possibility that Russian operatives may have been behind the hack. “Russia, if you’re listening, I hope you’re able to find the 30,000 emails that are missing,” he said at a news conference of personal emails Hillary Clinton had deleted while secretary of state. A spokeswoman for Deripaska has said the Russian businessman was never offered nor received briefings about the American campaign. Then, on July 29, Kilimnik emailed Manafort and cryptically told his boss that he had met that day with the man who had given Manafort the biggest jar of “black caviar” several years earlier, an apparent reference to money. Kilimnik said the man had messages to pass along to the Trump campaign chairman. Kilimnik suggested that he come to the U.S. for a meeting. But the court document filed last week showed that Mueller has gathered evidence that Manafort and Kilimnik had discussed a peace plan for Ukraine “on more than one occasion,” including during the campaign, when Manafort’s attention was focused elsewhere, his lawyers said. Days after the two men met in New York, Manafort was forced to contend with damaging news stories about his work in Ukraine. He resigned from the campaign Aug. 19. Washington Post writer Devlin Barrett contributed to this report.